My full day in Aviemore today, and I've made the most of it. The hostel is barely 10mins walk from the tran station and bus stops, so I caught the 31 up to the Cairn Gorm base station. I met a guy from Switzerland who'd been heading to Inverness and got off the train here on a whim. He had no map, no plan, and a will to birdwatch! He decided to come too, and I left him at the base station. I was taking the funicular railway to Ptarmigan station, just 120m below the summit of Cairn Gorm. It's the sixth highest mountain in the UK, with neighbour Ben MacDui coming in second. We could have seen Ben Nevis on a clear day, but there was some mild cloud haze that stopped us seeing the furthest visible peaks, 97 miles away! It was a breezy 5 degrees Celsius when our guide John led us out onto the mountain. Our whimsically winding ascent to the summit meant he could expound on Cairn Gorm and it's features. He knew so much! The surrounding peaks and the myths as to how they got them, the wildlife and history of human involvement on Cairn Gorm. He knew the name of every Corrie (the bowl-shaped scoops in the mountains that collect the snow and keep it all year round), the names of all the peaks we could see, and the stories behind them. Even the plants! He showed us a 1inch high clubfoot moss which, in the cretaceous era, would have been 40ft high, and another moss that was gather in WWII and used to staunch wounds on the Front due to it's antiseptic tendencies. When we reached 'Marquis Well', a spring near the summit, he stopped and invited us all to have a drink. The water is so clear here you can scoop it straight out of the ground. It's better than the water in my canteen, that's for sure! John pauses to show us around. Finally we reached the peak! It's a sparse and fragile landscape. Bleak and hostile, John called it, but these mountains are unmistakably majestic for all that. After our walk John invited us to eat lunch with him and the other staff... and kept on talking about the mountain. He obviously loves this place. When I got out my map to plan my afternoon he suggested a few walks I might take. Guided walks and tours have really made this trip for me, and recommend the Walk @ The Top to anyone who wants to really appreciate where they are. The oldest and youngest on our walk were a sturdy grandmother (with a fear of heights!) and her 6yr old grandson, and they managed fine. That said, the Highlands are not to be taken lightly, even at this time of year. Snow can fall at any time of year, winds have reached 150mph on Cairn Gorm's peak, breaking the weather equipment installed there, and John had stories for us about foolhardy walkers who had gone out in July wearing shorts, guided only by a phone app, and been caught in blizzards that cut out the phone signal and left them hypothermic by the time Mountain Rescue found them. Once I was back at the bottom of the mountain I caught the bus part of the way back to town and stopped to take a walk to Loch An Eilien. My map-reading stood the test, and I only had to make one detour round a field of cows with calves. 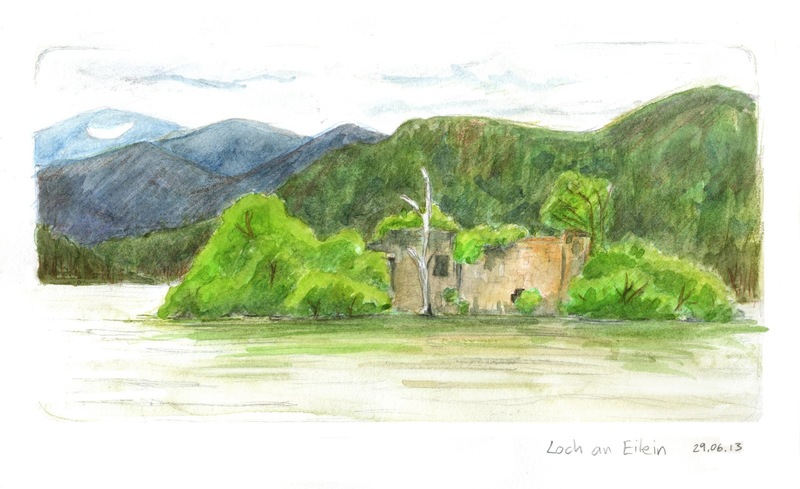 This loch is significant for having a ruined castle on it's small island, although no one knows who used to live there. Saw a young red deer on the way back to the road, and arrived just in time to sprint for the 31 bus as t passed me yet again. What perfect timing! A Heeland Coo! I shall call her Blondie! My legs are sore now and I'm very tired, which is a sign of a good day, but a shower and roast dinner at Ben MacDui's sorted me out. I'm packing too, because tomorrow I'm leaving the Highlands behind, and heading for home. I hope to come back some day. Sketch at the train station as I'm waiting to leave. The summits were completely covered in cloud.